Black Refutes Omarosa's Donald Trump-is-Racist Lie. You are here: Home / News / Black Refutes Omarosa’s Donald Trump-is-Racist Lie. Black Refutes Omarosa’s Donald Trump-is-Racist Lie. President Trump has been awesome for minorities; sending black and Hispanic unemployment to historic lows. 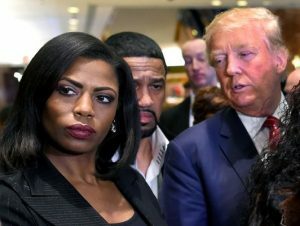 https://bit.ly/2MeGikU So what good does Omarosa’s unsubstantiated claim do for anyone other than feed the American left’s lie that Trump is racist? Clearly, Omarosa is another ego and power driven person making it all about her. The American left will treat Omarosa’s claim like manna-from-heaven; promoting it 24/7. The American left is so obsessed with blocking Trump from making America great again that they will use any and every despicable evil low-life tactic necessary. Along with 63 million Americans, I knew presidential candidate Trump had a heart for his country. This is why I am the singer/songwriter of the “Trump Train” music video. https://youtu.be/XKpesfFPK0U In a remarkable short amount of time, Trump has brought back jobs; putting Americans back to work. Our economy is booming. Trump has put the world on notice that they can no long undermine the US and expect us to shower them with money. Trump truly is a new sheriff in town standing up for America’s best interest. my point is as follows if you don’t follow the White House Staff. Violation of Employer Rule, you should be fired, let’s keep it there have been ex white house who was fired. anyone working for govt or non govt and you failed to follow the rules you signed off before hiring , you are fired ok. Just keeping it real white house staff if they can not obey white house staff rule. What would Malcolm X have to say about the Black celebrities meeting with Trump? … What would Malcolm X have to say about the Black … Black “leaders ..
Obama amnesty creates loophole for illegal … as their reason for breaking the law to … to more than 4 million illegal immigrants, ..
Omarosa fooled them all and will get paid for using Trump’s tactics against him. Wow he must feel dumb. The American politic process is a vicious science. Business is a vicious science. Law is a vicious science. Omarosa is holding her own in her struggles with president Trump. Quite frankly,I am proud of her performances thus far. She is proving that she is not one with whom Trump can take his liberties. I wish her well. OK to the indoctrinated, brainwashed, clueless and/or Cointel Pro author of this weak article, let’s talk facts and reality. The author of this article is a slave and i will debate him anytime with the facts. I should not have to prove Trump is a racist but for the sake of your readers, I will. 3. A white former Trump mgmt employee verified Trump called blacks lazy and said he did not even want blacks counting his money. 4. Over 70% of Trump insults are against black people. 5. Calling African nations shithole countries and saying we need more people coming from places like Sweden. 6. Trump saying at a rally “look at my African American”. 8. Trump spending a million dollars to persecute the Central Park 5 then continuing to persecute them with no apology even after DNA evidence cleared them. 9. Trump hiring a few key turncoat sambo Negroes in order to appear not to be racist. We see through that. 10. Trump calling Omarosa a low IQ dog etc. Not like when he said others were “like dogs”. That is not the same thing. 11. Trump sued by the Justice department TWICE for discrimination against black people in his hotel properties. 12. Trump on the Birther issue was wrong and being a racist. 14. Donald Trump persecuting mainly black football players calling them SOBs. 15. Donald Trump on immigration against Hispanics at the border and separating their families with a zero tolerance policy and no plan to put them back together. Yet nothing said or done to address the majority of people here illegally who are here because of expired Visas. And nothing said or done towards the Europeans, Canadians and Asians who are here illegally. If Trump is not a racist, ask him how he would feel if Ivanka was single and dating a black man. I can keep going but anybody who cannot see and admit that Trump is a racist is blind, dumb, brainwashed or in denial. And I do not have all day to type about racist Trump. And as for his help towards the black community, unemployment in the black community began dropping under Obama and the recovery of the economy, also done by Obama, has continued the trend that Trump takes credit for. Trump created jobs but not 700,000 to date because they are included a time when Obama was in office. Fact check that for yourself. The White House Press Secretary Sarah Sanders lied and had to apologize, though she did not correct her lies. Obama’s actions and efforts created over 3 million jobs for black people but Sarah Sanders lied and said Trump had created more jobs for black people than Obama. Fact check people. Here are Obama’s final numbers in the link below. Facts matter. You have to be kidding me. The author of this article is so detached from facts and reality that he has become an indoctrinated Trump zombie. my message to the author is that I would love to debate you anytime you like under any media Outlet About the inaccuracies of your article and that’s your position. Donald Trump is verifiably a habitual liar. You need to look at the final numbers For the results that President Obama made. And I say this not being a Democrat. You are detached from reality And you have drink every drop of the Kool-Aid, made some more and drank that too. now you simply pull a page from the plump Trump zombie Playbook and engage in character assassination of Omarosa when she is acting Just like him, using his tactics and bullying a bully. Keep in mind that his lies far surpassed hers and he Is no person to question someone’s credibility.